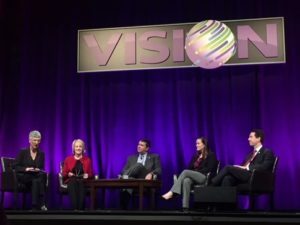 Note: Once again this year, Advance CTE attended the CareerTech VISION conference hosted by our partners, the Association for Career and Technical Education (ACTE). What follows are our staff’s highlights and favorite moments. You can read Part 1 here. At Advance CTE, we are thankful for our members across the country and the multitude of partnerships with national organizations and groups. In this blog post, we want to celebrate the richness that our members and partners bring to the work we do as Advance CTE. Our partnership with ACTE, in fact, has allowed us to incorporate the successful Career Clusters Institute into the annual Careertech VISION conference. Also this year, we are celebrating the fifth installment of our joint publication, Year in Review: State Policies Impacting CTE. One key takeaway for me from this year’s ACTE VISION conference is the importance of communication and collaboration between state and local actors. At the conference, I shared some early trends from our annual Year in Review report, which we plan to publish in partnership with ACTE in January, and discussed some notable policies states passed over the year. Towards the end of my session, one of the conference attendees stood up and said that, despite her state legislature’s best intentions, a new program that was launched a few years ago had not achieved its desired goal, and that much of the money destined for teachers had been lost along the way. Sadly, stories like this are all too common. It’s important that states identify promising practices at the local level and adopt policies that allow their success to flourish. Take Oakland High School, just outside of Nashville, for example. Oakland’s mechatronics program, which was one of our 2017 Excellence in Action award winners, was formed out of a partnership with local industry leaders who identified a workforce need and reached out to the school. And, while Tennessee is a state with high standards for program design and quality, state policies allowed the program to grow and flourish, helping students earn valuable credentials and earn dual credit. Today many students in the program graduate with up to 29 postsecondary credits that articulate directly to a postsecondary degree. For the second year in a row, Advance CTE and ACTE worked together to create a space for State CTE Directors and ACTE state executive directors to meet and collaborate. This year’s session attracted nearly 50 state leaders from 20 states. Throughout the session, the state leaders worked to strengthen their partnerships to further advance high-quality CTE. State leaders shared the multitude of ways in which they partner — from collaborating on teacher professional development to providing a common front to the state legislature to secure more funding and quality policies. Educate and engage with CTE stakeholders on the need for global competence in order to prepare students to meet the demands of careers in a global 21st century. Educate CTE teachers and students about the global career opportunities that exist in CTE pathways. Build educator capacity to integrate global competence and project management into CTE career exploration and classroom projects. During CareerTech VISION, Asia Society, ACTE and Advance CTE convened an advisory committee of state and local leaders and partners to reflect on the current Global CTE Toolkit, the Global Competency Through CTE course (hosted on ACTE’s CTE Learn Platform), and provide input into the next professional development resources, which will focus on global STEM projects. Look forward for more information on both projects in coming months! It’s always a treat to see our Advance CTE members at ACTE’s annual conference, and we were delighted to see how many of our state leaders were sharing best practices during sessions. Friday morning’s opening general session was a panel featuring state leaders from across the country, including Advance CTE members Charisse Childers from Arkansas and Heather Justice from Tennessee (along with Stephen Pruitt, Kentucky’s Commissioner of Education and Steven Partridge, Vice President of Workforce Development from NOVA Community College). Justice discussing Tennessee’s efforts for secure a statewide MOU, allowing industry-recognized credentials earned in high school to automatically articulate to postsecondary credit at the state’s colleges of applied technology. Partridge sharing Virginia’s innovative postsecondary funding models to support and incent credential attainment not just among “skill builders,” but for under-educated citizens looking for new opportunity. We look forward to seeing even more of you in San Antonio, Texas, for the 2018 CareerTech VISION conference! This entry was posted on Friday, December 15th, 2017 at 6:27 am	and is filed under Uncategorized. You can follow any responses to this entry through the RSS 2.0 feed. Both comments and pings are currently closed.